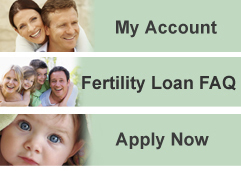 ﻿ Applying for a Loan with FertilityFinance.net is easy. Click here to complete the secure, online application. Pre-approval will be provided within 24 hours. Fertility Finance will coordinate with your fertility center to determine the exact loan amount required for treatment. Final loan documents will be signed. Funding for fertility treatment will be sent directly to your physician within 2 business days of your loan acceptance.